Sniper Ghost Warrior 3 is a promising and somewhat ambitious concept that’s plagued with some monstrous game-breaking technical issues, inconsistent AI and some downright curious design choices. Some of it can doubtless be patched but as it stands, this is far from a finished product. There’s absolutely no doubt that in real life, being a military sniper requires an incredible level of attention to detail. It isn’t all about relying on your gadgets to tell you if the shot you’re about to take will be successful and very rarely is there a time for second chances. You don’t just get dropped into position, take the shot, and then get airlifted away, either. Getting to the safest location possible so that you can take out your targets is half of the battle. With this in mind, City Interactive have – for the first time in the franchise’s history – taken Sniper Ghost Warrior 3 into open world territory. Set in modern-day Georgia (the country, not the state), the game throws you into the middle of some warring factions who are set on starting another Cold War. Your goal of course, is to stop that from happening, while also trying to rescue your recently kidnapped older brother, who is mentioned in what seems like every other line of dialogue. Once the prologue is over, you find that you’re more or less on your own. Your safehouse is where every mission begins (simply due to you being able to see all the mission briefs on your tablet, but not being allowed to select one unless it’s docked) and where you go from here is up to you. The world is – as you’d expect – dotted with side-missions, targets from the Most Wanted list, collectables, outposts to take over, and supplies. Early on, it soon dawns on you that being conservative with the amount of ammunition you expend will likely be important. In an open world, you don’t just find that your weaponry has been replenished when you select the next mission, of course. 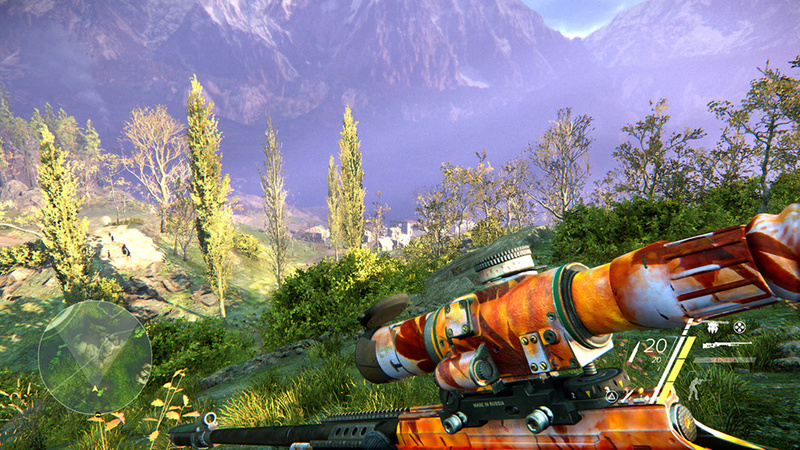 Whether you take the sniper route and primarily take out enemies from a distance, the warrior route where try to you run in all guns blazing as if you’re playing a Call of Duty game – which varies in its effectiveness – or the ghost route, where you’re crafting traps and devices to defeat your foes without firing a single bullet, making sure you have enough firepower on hand is key. In fact, hunting around for weapons caches or resources that can be used to craft weapons back at the Safehouse could have been one of the most entertaining parts of the game. Not knowing whether you’ll have a bullet for the next enemy that sneaks up on you could have been something that really increased the tension levels. Unfortunately though, in the first of many huge missteps, the developer has gotten this all wrong. The crafting system is made entirely redundant by the sheer amount of rewards you’re given for completing the simplest of missions. 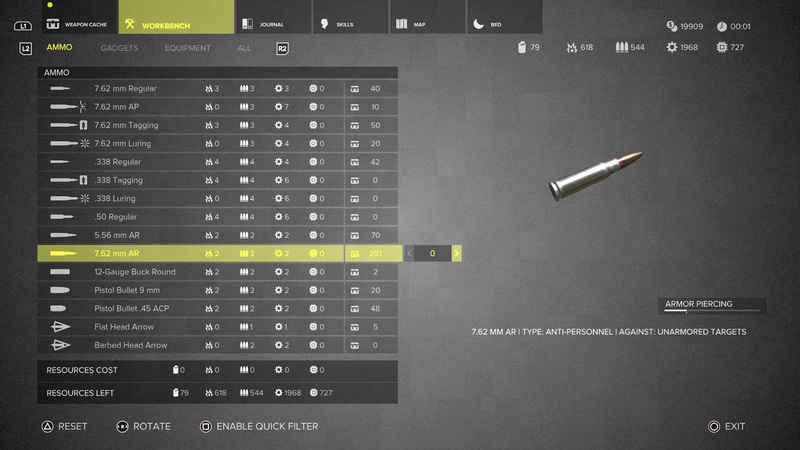 In my time with the game, I didn’t need to use the crafting system once, given that I could simply skip to the next tab over and buy whatever weaponry, ammunition, or mods that I needed, while still having plenty of currency left over for next time. So then, tension is provided solely by the stealth elements of the game and to its credit, Sniper Ghost Warrior 3 at least starts to make an admirable fist of things. Finding out where the enemy forces are positioned (usually by sending up a drone) is generally your first task. The drone tags soldiers that you find as you fly it around the area, but sometimes isn’t quite as precise as it should be. Sometimes you’ll zip over a sniper tower without focusing on the gunman and it’ll pick him up right away. At other times, you’ll carefully glide low over the heads of a group of four soldiers and it will absolutely refuse to tag them. Even still, it generally works well enough to get the job done eventually. From there, it’s a case of planning the order in which you need to take the opposing forces down so that the remaining guys aren’t alerted by the presence of a dead body slumped right in their line of sight. Creeping around, taking refuge from prying eyes by jumping in dumpsters, carefully stepping through bushes, hiding bodies in cabinets, and making sure that you’re not making too much noise is the order of the day and at times, you could cut the tension in the air with a knife. Well, until your colleague bellows “DON’T FORGET TO GRAB THAT CRASHED DRONE” or the like at a thousand decibels through the DualShock 4’s speaker. It’s enjoyable and rewarding when the little plan you’ve made in your head works perfectly and you get in and out without the opposition even having the remotest chance of having seen you. However, no matter how careful you are, the chances of that happening are quite small at times. Inconsistencies are present in the AI. Some enemies seem to be as blind as a bat and would carry on nonchalantly rolling their cigarette if you rocked up to them in a tank and said “Hey buddy. I’m here to kill everyone and blow up the base. Is that cool?” Others however, appear to be able to see you through a wall, a barrel, a dumpster, another wall, and a couple of hundred feet of bushes. That’s all well and good until you reach a mission where alerting a single enemy is enough for you to instantly fail. Even more annoying is when the game gives your position away in a completely unreasonable manner. Climb ten ladders silently, and you can guarantee that the eleventh will be positioned next to two soldiers you’re trying to sneak past and your character – who was apparently once trained to be stealthy – lets out a “HUUUUUH!” as if he’s trying to jump over a chasm on a pogo stick, when he’s actually just stepping on the bottom rung of a ladder that’s at ground level. 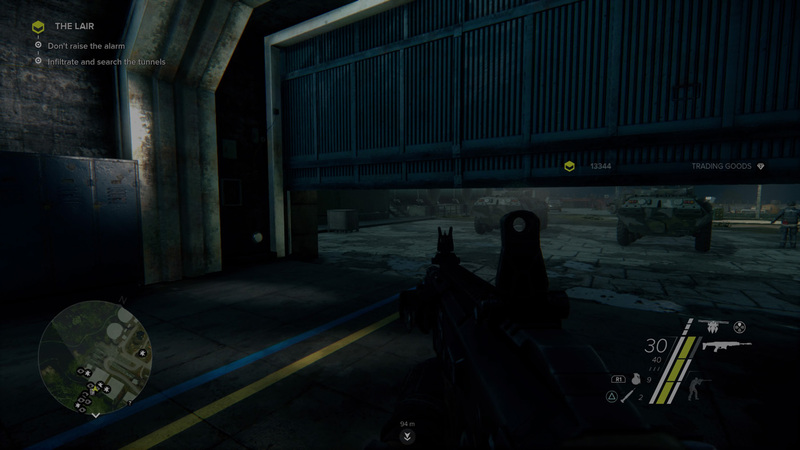 But the absolute most frustrating part of Sniper Ghost Warrior 3 has to be the technical performance. This is – in my experience – the most crash-happy game available for the PlayStation 4. Even with the now customary day one patch installed, the game falls over with alarming regularity. Sometimes it will just shut itself down for no reason. Sometimes it’ll bring up a system-level error message and kick you out. Sometimes the screen will just freeze entirely while the game audio carries on without an issue. During my playing time, I counted 17 instances where one of these things happened and I had to restart. Just so we’re clear, that isn’t a typo. Seventeen times. Part way through the first act – about four missions and a couple of hours in – one crash caused the game to forget certain parts of my progress and threw me back to the first mission. The only problem was that it remembered my ammo level – I had two bullets left – but forgot that I had any money or resources. Great. Given the nature of the game, where even early missions can take 20 minutes or so to complete, this is a total nightmare. Mainly because when you reload, you’re often sent back to the Safehouse or at best, the mission’s starting point. There’s only so many times you can spend a couple of minutes driving to your mission (in the one vehicle that you’re allowed to drive) and then ten minutes marking out your plan and taking out snipers so you can invade a base without being seen, only for that hard work to be all for nothing. It should be noted that I was playing on a PlayStation 4 Pro with Boost Mode disabled, but a brief test on a regular launch PS4 proved that the situation occurs across the board. What makes the constant crashes worse – as if they weren’t bad enough – are the utterly abominable loading times. If you load the game up and select “Continue Game” from the main menu, you then get to sit and watch a loading bar for FOUR AND A HALF MINUTES. The same loading time is present when you switch regions during the campaign. Without the crashes, this ridiculous waiting time would be bad enough. With them, it’s much, much worse than that. Sit down for two hours of play and you could well be spending half of it watching the loading screen, given the amount of times that the game is likely to crash and kick you out to the dashboard. Add that to a jumpy framerate that doesn’t really help when you’re trying to pinpoint an enemy soldier’s temple from 400 meters away, near constant examples of clipping, comically bad “bullet camera” impact effects (watching a bullet head directly towards someone’s eye and then seeing his neck explode for no reason at all is genuinely funny), some pretty bad instances of pop-up, flickering textures, a couple of mission checkpoints that randomly refuse to trigger (until you do the whole mission again) and map markers that are quite often misleading to the point of being entirely wrong, and you’ve got a game that really doesn’t do itself any favours. The sad part about all of this is that the all-too-brief periods of time where Sniper Ghost Warrior 3 actually works conceptually and technically are sometimes enjoyable. There’s the makings of a tense tactical open world game here. The problem is that a handful of little problems and equally large handful of bigger problems will soon make you forget those few times that you were close to having fun.